same here. I'll be 69 right around the corner and tho all the kewl kids seem to have 'em, I don't have an Instant Pot.. I am 67. I don't have a cell phone. My daughter says I am one of 3 people in the entire world with no cell. I told her the other 2 people would be disappointed if I got one now. She said she would call me more often if I had one. I asked her what is wrong with calling my land line? If I don't answer leave a message and I will call you back. Sometimes I wonder ( what is the plan) when in 1942 ww 2 started how isolated the world was and America was recovering from the depression and a lot of farmers were plowing with mules , at the beginning of the war the German army had 514000 horses by the end of the war they had deployed 2.75 million horses and mules then 26 years later we landed people on the moon. How has the world advanced so quickly and what will be the end result. My parents were older when I was born my dad was 50, and my mother was 46. My paternal grandfather was born in 1894 and passed away in 1979, I was just 4 then but can remember him. my other grandfather and both grandmothers were all born in it before 1905. Both my parents families were farmers, my dads family were tenant farmers, and my mothers family's were all landowners. Some of her family had been here in the county since 1803, I'm a 7th generation farmer. A father and son of that family fought in the revolution and came here afterwards from what would be present day West Virginia. The elder man's grave site was bulldozed by some be nice years ago. My mother says her family raised tobacco some corn, had a few milk cows and some beef cows, along with sheep, hogs and some chickens. My grandmother tended the garden. My garland father worked horses and mules. Mama says they never killed a beef, says about the only meat they are was pork, they cured hams and shoulders. Says they mainly ate from the garden and what was canned from it. I can remember as a child walking into my grandmother's kitchen and seeing hog heads in the sink, where she was going to make souse. They sold some veal calves and lambs, dressed chickens to sell to a grocery store. My grandfather hunted and trapped for furs, even skunks. My dads family were tenant farmers in a big cattle farm in Fayette County. My grandmother says that they used to have beef evidently did it in the winter because she said they would have it hanging in the barn and go out and cut pieces off to cook. They didn't let anything from a hog go to waste either my granny said they cleaned the hog intestines by tying them to a rock in swift moving creek. Dad always had a fondness for pig feet, I never tried it. I often think what would some of the older people think if they came back and saw how things are done day to day now. Values, morals, dedication, perseverance, strength, faith. Doesn't seem to be as much of a priority among a significant number of younger generations now. My parents were polar opposites; she was an only child from a wealthy family & he was one of 9 kids, dirt poor (aforementioned outhouse, living off the land, etc). Started dating when she was 13, he was 19, married almost 64 years now. My brother & I were fortunate to be exposed to "both worlds" and it was understood we weren't going to be coddled, given everything we wanted just because they could. And I married a man who had no indoor plumbing until he was 8, dug his way out of poverty through hard work & education, became a CEO & retired at 54. We aren't "old" (which is subjective) but simply cannot relate or understand the direction our society is headed. I may be feeling the years a little, but I sure don't feel out of place. This is my place all others are out of place. My kids answer the phone when I call or call me back. I don't text and they know it. Nobody else texts from where I live either, they don't have cell service when they get here. My mom would have been 105 today she passed in 02. I often think of the innovations they witnessed, from horse and buggy to man on the moon. My grandma never did believe we had put a man in outer space when she died in 1966 that was light years from 1880 when she was born. My Father was born in 1888. I remember well Mother making hominy outside in the old cast iron washpot. She boiled hog heads in it to make souse. She also set a bowl of milk out with a cheese cloth covering to let it "clabber". I guess she made buttermilk from it. We kids would get a cup full and eat it like Jello. She also made butter in an old fashioned wooden churn. This thread has really brought back some memories. Probably was the first step in making cottage cheese. After it clabbered it went to the clothes line in a flour sack to drip dry. Never did and still don’t like the stuff. Still have the washpot Dad’s mom had. Mom made soap in it, heated water to wash clothes in it and of course the hog killing duties. I remember a glass jar with a wooden paddle to churn butter. Later she used a Sunbeam mixer to churn it out. Milk is clabbered to make butter. You ain't lived the life till you had a mess of hog brains and scrambled eggs. Dang it man. Between you and he, y’all have covered quite a span of years. You must have came along when he was a good bit older than “normal” child rearing age. On another note, good thing people don’t have to live like that today. Bc they’d starve. Most people would have no idea how to make their own groceries. I’ll admit, that there’s some of it that I don’t know how to do either. I’ve never made butter and cheese for one. But I can get a chicken, cow, or hog from the pen to the table so maybe I’ll make it. I can shop a Kroger or Publix like none other. Some of you are way ahead of me. 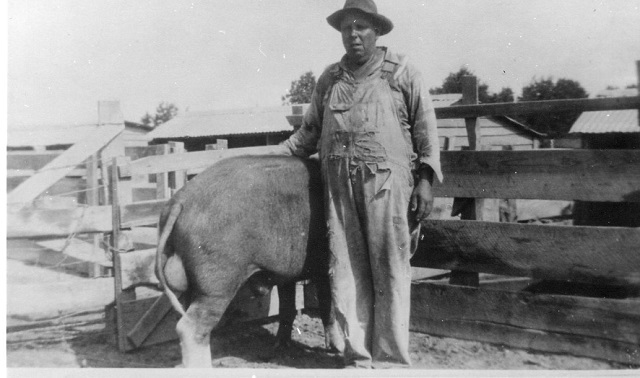 I wouldn't starve, but probably wouldn't be eatin as high on the hog as my maternal grandfather was. I have made butter and cheese before, but till Falfurrias creamery goes out of business, I'll just keep buyin it. I wonder if Mr. Gravlee meant his Grandfather? I am 68 and my Grandfather was born in 1882. It is possible that his father was maybe 40 or so when Mr. Gravlee was born but that would still make Mr. Gravlee almost a 100 years old. My Father was 54 when I was born. You can do the math if you want to know how ancient I am. I'm just glad to be here.